Let’s look at nine of the most important such exercises. Seeing how small we are in the grand scheme of things is only one portion of this exercise. The second, more subtle point, is to tap into what the Stoics call sympatheia, or a mutual interdependence with the whole of humanity. As the astronaut Edgar Mitchell, one of the first people to actually experience a real ‘view from above’ put it, “In outer space you develop an instant global consciousness, a people orientation, an intense dissatisfaction with the state of the world, and a compulsion to do something about it.” Take a step back from your own concerns and remind yourself of your duty to others. Take Plato’s view. The quote from Seneca above takes part of Memento Mori—the ancient practice of reflection on mortality that goes back to Socrates, who said that the proper practice of philosophy is “about nothing else but dying and being dead.” In his Meditations, Marcus Aurelius wrote that “You could leave life right now. Let that determine what you do and say and think.” That was a personal reminder to continue living a life of virtue now, and not wait. Meditating on your mortality is only depressing if you miss the point. 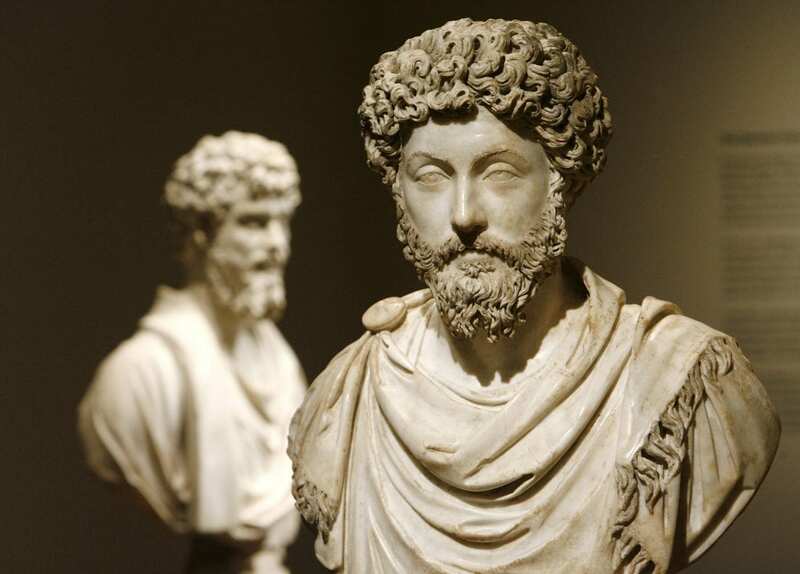 The Stoics find this thought invigorating and humbling. It is not surprising that one of Seneca’s biographies is titled Dying Every Day. After all, it is Seneca who urged us to tell ourselves “You may not wake up tomorrow,” when going to bed and “You may not sleep again,” when waking up as reminders of our mortality. Or as another Stoic, Epictetus, urged his students: “Keep death and exile before your eyes each day, along with everything that seems terrible— by doing so, you’ll never have a base thought nor will you have excessive desire.” Use those reminders and meditate on them daily—let them be the building blocks of living your life to the fullest and not wasting a second. The single most important practice in Stoic philosophy is differentiating between what we can change and what we can’t. What we have influence over and what we do not. A flight is delayed because of weather— no amount of yelling at an airline representative will end a storm. No amount of wishing will make you taller or shorter or born in a different country. No matter how hard you try, you can’t make someone like you. And on top of that, time spent hurling yourself at these immovable objects is time not spent on the things we can change. Return to this question daily—in each and every trying situation. Journal and reflect on it constantly. If you can focus on making clear what parts of your day are within your control and what parts are not, you will not only be happier, you will have a distinct advantage over other people who fail to realize they are fighting an unwinnable battle. in Stoicism the art of journaling is more than some simple diary. This daily practice is the philosophy. Preparing for the day ahead. Reflecting on the day that has passed. Reminding oneself of the wisdom we have learned from our teachers, from our reading, from our own experiences. It’s not enough to simply hear these lessons once, instead, one practices them over and over again, turns them over in their mind, and most importantly, writes them down and feels them flowing through their fingers in doing so. The premeditatio malorum (“the pre-meditation of evils”) is a Stoic exercise of imagining things that could go wrong or be taken away from us. It helps us prepare for life’s inevitable setbacks. We don’t always get what is rightfully ours, even if we’ve earned it. Not everything is as clean and straightforward as we think they may be. Psychologically, we must prepare ourselves for this to happen. It is one of the most powerful exercise in the Stoics’ toolkit to build resilience and strength. Seneca, for instance, would begin by reviewing or rehearsing his plans, say, to take a trip. And then, in his head (or in journaling as we said above), he would go over the things that could go wrong or prevent it from happening—a storm could arise, the captain could fall ill, the ship could be attacked by pirates. By doing this exercise, Seneca was always prepared for disruption and always working that disruption into his plans. He was fitted for defeat or victory. It is why amor fati is the Stoic exercise and mindset that you take on for making the best out of anything that happens: Treating each and every moment—no matter how challenging—as something to be embraced, not avoided. To not only be okay with it, but love it and be better for it. So that like oxygen to a fire, obstacles and adversity become fuel for your potential.